Monday, we took a look at some of the top receivers to target if going with running backs early in your fantasy drafts. Today we’re going to take a look at the inverse. Injuries and low scoring across the wide receiver position last year has led to a shift of running backs being taken early and often in fantasy drafts in 2018. As a result, there might never be a better time to try to implement a #ZeroRB approach than this year with drafters chasing last year’s running back productivity. Whether you willingly opt to take this strategy into your league or just so happen to find yourself with the last pick in the first round with both Odell Beckham Jr. and Julio Jones available, starting with a WR-heavy approach can be a contrarian way to win your league. Let’s dive into some of the top running back options to pursue if beginning your fantasy draft with a WR-heavy start. Even prior to Sony Michel’s injury, all signs were pointing toward Burkhead having an early lead on the rookie as the team’s No. 1 back on the depth chart. Burkhead proved last year that he could be a prolific scorer for New England, leading the team in touches inside the 10-yard line (21) while scoring on seven of them (33.3 percent). He was able to accomplish that feat despite seeing just 24.5 percent of his team’s offensive snaps last year. That number is sure to grow with Michel’s injury and the departure of Dion Lewis. Burkhead was a small sample superstar, averaging 1.04 fantasy points per touch. With the starting gig currently in hand (and a clean bill of health returning to practice), Burkhead could be a dark horse to finish as a top-12 fantasy back if he’s able to sustain similar fantasy efficiency. The season-ending injury Derrius Guice sustained has opened the doors for Thompson to become one of this year’s best mid-round fantasy values. Despite playing on just 51.5 percent of the snaps when active in games, Thompson averaged 15.1 PPR points per game. Only 10 other running backs eclipsed that value on the year. His receiving ability — he had five or more targets in all but one of the full games he played — led to him finishing as a weekly top-12 back in five of the 10 games he played. We saw what kind of fantasy role Thompson could have last year in essentially the same situation behind a banged-up offensive line. Entering the year with a healthy offensive line that boasts top-12 potential, Thompson could catapult back up into fantasy superstardom this season. Playing on just 44.1 percent of Atlanta’s offensive snaps, Coleman was able to churn out quite the productive fantasy finish last year. He finished the year as the RB22 while being one of the most efficient fantasy backs on a per-snap basis. Coleman ranked top-10 last year in PPR fantasy points per snap (0.41), besting several of last year’s most prominent backs — Melvin Gordon (0.40), Le’Veon Bell (0.38), and even teammate Freeman (0.38). Coleman’s ceiling remains capped with a healthy Freeman in the mix, but it’s still noteworthy just how many usable fantasy weeks he had last year. Coleman posted seven weeks as top-24 running back, a feat only 15 running backs surpassed. A current seventh round selection, Coleman possesses weekly flex appeal with the upside of becoming much, much more in the event Freeman were to miss any games. Despite being suspended the first two games of the year, Jones carries immense upside as perhaps the Packers’ most well-rounded back. Weeks 4-7 last year, Jones was the fantasy RB8, averaging 16.8 touches per game. A knee injury cut his rookie season short, but the explosive receiving back looks to be the most well rounded of the running back trio in Green Bay. The Packers start off with two difficult rushing matchups against the Bears and Vikings, but then take on one of the softest rush defense schedules. It’s not difficult to paint a picture where Jamaal Williams falters against the tough defenses, opening a door for Jones to touches upon his return. 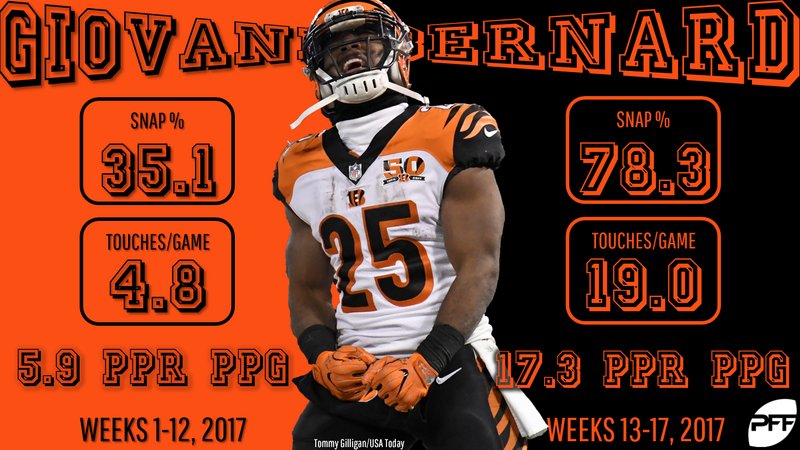 We saw last year what Jones could do when given an opportunity (5.53 yards per carry) and his current ADP makes him a very affordable mid-round selection. Last year the Eagles ranked third in points scored, top-five in red-zone trips per game and converted 64.1 percent of their red-zone trips into touchdowns (second-highest). The latter statistic is the one I want to hone in on here, with LeGarrette Blount’s departure leaving potential goal-line work for Clement to capitalize on. Blount’s 10 carries inside the 5-yard line led the team (55.6 percent), with Clement second on the team with four. Jay Ajayi had zero. If the team’s not confident in Ajayi in these short-yardage situations, Clement could turn into a Latavius Murray-esque goal-line-stealing back with upside. Philadelphia has 190 unclaimed handoffs up for grab this year. If Ajayi were to miss any time due to injury, Clement could become an every-week fantasy starter. Two Patriots running backs on a list of 10 players? You betcha. The Patriots backfield can be difficult to predict which back emerges, but the two I’m most interested in investing in this year are Burkhead and White. Why White? I’m simply chasing the targets. Last year the Patriots threw the third-most pass attempts to their running backs. Enter White, who has a combined 156 receptions over the last three years, per the PFF Fantasy Playbook. Only four running backs have more during that span. White also had at least six targets in six different games last year. Only eight running backs had more such games. In full PPR leagues, White’s well worth the admission with a Round 11 price tag. Bernard’s ADP remains one of the more baffling things entering the 2018 season. Not only does he have terrific standalone flex value as a top-end receiving back, he immediately would be thrust into a starting role if anything were to happen to Joe Mixon. We saw exactly what that looked like last year when Mixon was banged up over the final month of the season. Bernard was able to score the ninth-most fantasy points among all running backs during that time span. One could argue there’s reason for more optimism in 2018 with an improved offensive line that acquired Cordy Glenn and Billy Price this offseason. Bernard’s a dependable receiving back that is going far too late in fantasy drafts this year. Running a 4.38-second 40 with a 5-8, 198-pound build, Hines is built to be an electric playmaker in space. Hines has reportedly been lining up everywhere along the formation all offseason and could be a threat to score anytime he touches the ball. The former receiver could see a ton of work as Andrew Luck’s safety check down and while the Colts operate the no-huddle. In Luck’s last two full healthy seasons (2016, 2014), Frank Gore saw a career-high in receiving touchdowns (4) and so did Ahmad Bradshaw (6). Luck loves to utilize his tight ends and running backs when deep in the red zone, where Hines stands to benefit greatly as the receiving back on this squad. Be sure to monitor Breida’s shoulder injury prior to your draft, but as of now, it looks like he’ll be ready for Week 1. Currently No. 2 on the depth chart, Breida will be used to form a one-two punch with free agent addition Jerick McKinnon to form one of the most athletic running back tandems in the league. McKinnon’s athleticism has been his calling card for years, but Breida is no slouch in that department either. The 88th percentile SPARQ-score athlete was used sparingly as a rookie but should have his number called much more often in his second year. McKinnon has never been given workhorse-like touches despite having several opportunities in Minnesota to do so. Adversely, we’ve seen the success Kyle Shanahan had with a two-back system in Atlanta. Breida could be his arbitrage version of Coleman that’s going way too late in fantasy drafts this year. This stat is so dank I debated even tweeting it out. Bilal Powell is RB58 by ADP (so dumb). In preseason this year, he’s played 24 of the team’s 27 first quarter snaps. And 5 of his 13 routes have come split out as a wide receiver. The Jets are clearly trying to get Powell out in space where he can be mismatched with linebackers. The Jets could find themselves trailing in games quite often this year, leading to extended time for Powell as their receiving back and best option for no-huddle. We’ve seen stretches over the past few years of Powell putting up fantasy points in spades. Essentially free in drafts, Powell could be a quality streaming option when bye weeks start to hit.